I'd read a little while ago that people should look closely at the demographic details of these shifts. If STEM disciplines have become more welcoming to women, in particular, in recent years, then the shift of women from humanities to STEM programs may explain a significant amount of the shift. Yes, that might be a factor, Anon. My guess is that there isn't a big enough shift in other fields for this to be the primary explanation. 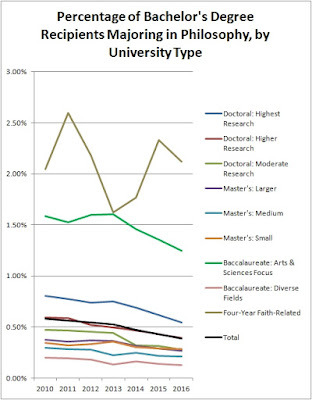 For example, in the physical sciences, women have slightly decreased as a proportion of majors in the past several years. Race and ethnicity is another possibility along these lines, which I plan to examine soon. Hi Eric - Interesting, but perhaps its all due to the economic crash in 2008. My wife and I had three college graduates that year - majors were econ/history, finance/statistics and zoology/Japanese. If the three of them had enrolled in 2008 instead of graduate, I suspect their choice would have been different. It would be interesting to look at longer trends and see if my hypothesis holds. I graduated in '73, just before the hard times hit - and I recall hearing that the entire culture of incoming students in the late '70's had shifted to a much more conservative bent. George, that might be the case, but if so it must be combined with some other factors, since the recessions in the early 1990s and early 2000s don't correlate with sharp declines. It would be interesting to have data going back earlier. Those are harder to obtain, but I'm working on it. glad to see more college grads will now have jobs with useable skills and not philosophy. But people can't think very well these days either, right? <--Very employed PHI grad. "More useable skills and not philosophy"--Please stop perpetuating this garbage fallacy. "In 2013 the Association of American Colleges & Universities issued the results of a survey of 318 employers with 25 or more employees showing that nearly all of them thought that the ability to “think critically, communicate clearly, and solve complex problems”—the precise objectives of any liberal arts education—was more important than a job candidate's specific major." 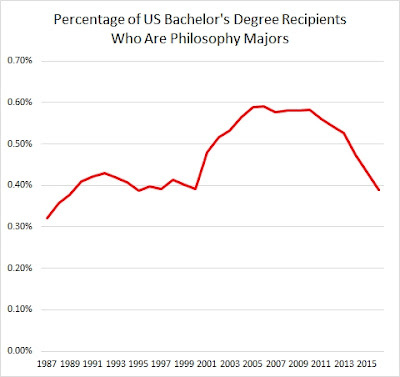 Philosophy grads are stilling winning the earnings race, so now we can tell them they have less competition from other phil grads. Cynthia here: But there appears to be a slight graduation rate decline in the mid-nineties, which would be about the time a student enrolling in the early 90s downturn would be graduating. After that, it never really picked up again. Another factor may be a possible decline in the availability of philosophy programs. I agree with others who point out that the incentives to graduate in 4 years has the potential to affect our discipline. I am in Texas, and my public university is starting to develop and implement these incentive and restrictive structures. Very interesting! Thank you for the post. At my own institution, a regional comprehensive without a grad program in philosophy, we face all the pressures you mention as well as a 150% surcharge for credit hours in excess of the number of credits required for a degree program (and this number is set by the *first* major one declares, even if one switches majors). Students are also encouraged to declare a major as soon as possible; administration seems to think this is good for retention (one of our "performance funding metrics"). 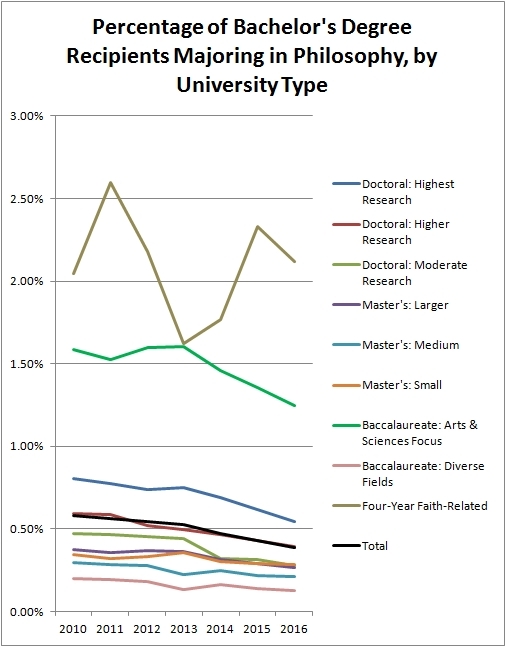 For reasons unknown (though what I expect to be turf protection), many degree programs, especially in STEM, are so credit hour heavy, that philosophy gets squeezed out as even a viable option for a minor, much less a second major. Additionally, administration does not provide proper support when faculty go on leave, effectively relying on existing faculty to cover colleagues' typical upper-division offerings (in service of our majors), thereby reducing the number of lower-division courses that are offered in a semester (the courses from which we recruit). We recently had a retirement as well, and so we've been asked to wait at least a year before filling that line. In the meantime, our capacity to recruit is consequently diminished and it seems unlikely that we will be allowed to keep that line. Sorry to be boring, but I am curious even for anecdotal evidence about changes in credit taken (as opposed to majors). Our department experienced a spike in majors more or less coincident with the spike you show, but our total credits have changed much less (as you'd expect - -for most departments majors account for a smallish percentage of credits). Like you I'm a fan of the philosophy major, for the right students, but I'm more of a fan of getting students who are in less interesting majors (because of parental pressure, or short-sighted market thinking, or authentic preference) to take a couple of philosophy classes -- and really learn from them (which means we have to teach well, and not with the same goals or strategies we have for majors). Dennis Ahlburg, an economist at Trinity University, has a volume in process looking at whether there is crisis in the humanities in various countries. His own contribution is on the US, and analyses data for humanities majors over several decades, which would give you some more context. (I can ask his permission to send a draft of his chapter to you if you like. I'm an author the UK chapter). I know he doesn't have data on credits, just majors. I graduated with a double major in Philosophy and Computer Science. I loved being able to write about Kierkegaard as well as program in Ruby in my undergraduate years. That would be my recommendation for those prospective university students who want to study a liberal art discipline, but also learn an economic trade: DOUBLE MAJOR!! I guess the lack of liberal arts majors explains how Russians were able to reach 100 million Americans during the election, and how the flat earth society surpassed 100,000+ likes. Of course, I agree that philosophy majors tend to develop skills in critical thinking, and this is borne out in a variety of metrics (like standardized test scores). The problem is that it doesn't matter if philosophy majors are great at the things employers want if employers don't know that philosophy majors have these skills. Philosophy continues to have a PR problem such that no one knows what the hell we do (not even, on the deepest level, philosophers themselves). Look, I was a philosophy major and I was able to find a job that I enjoy, and I can even say my background in philosophy was a good preparation. But the economy cannot productively absorb 8000 philosophy majors every year without a good number of them being underemployed, and with the economics of higher education being as they are, I can't help but think it's irresponsible to continue to offer the major without building in some kind of career preparation. 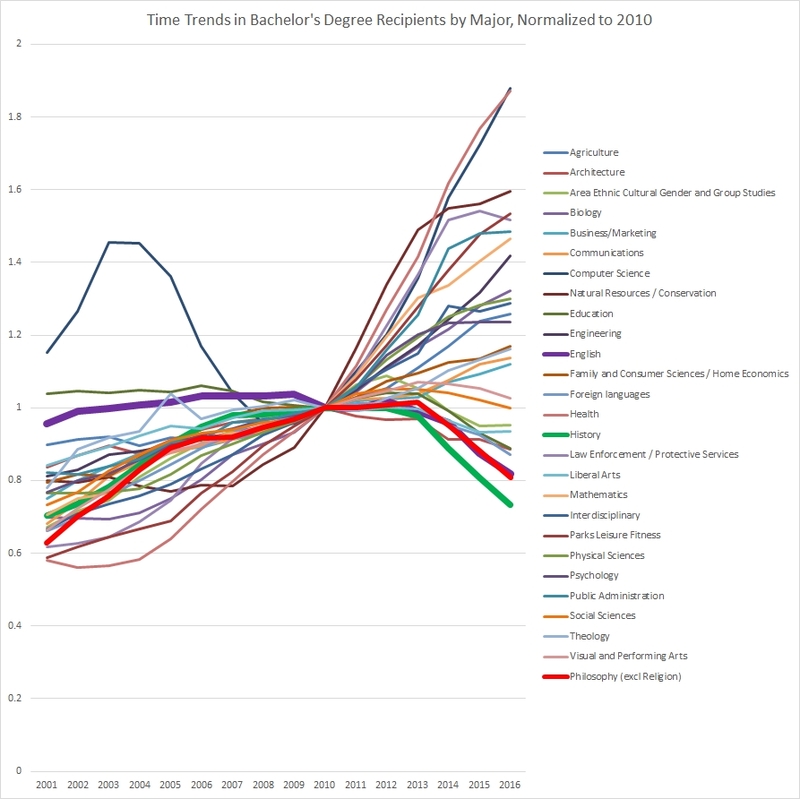 As to Eric's original question, I think the downturn in interest in the traditionally frowned upon majors is unquestionably correlated with the recession. Past recessions did not also include the feature of exorbitant tuition to the extent that present students see. When I was teaching I'd occasionally show a video about the extrinsic value of philosophy (read: $$$), but if I were still teaching I'd definitely invite the pre-law advisor or someone from career services to come speak to my class. And for those who think, "it's not my problem if my students get a job or not, I'm just supposed to explain the analytic/synthetic distinction," I would just say that I think the future of philosophy as a subject in universities, especially with the political culture we have now, is legitimately at stake. As a student at a california community college, I got on the bus to go home, a man got on with me and sat next to me on the ride. We talked, turns out he had just applied to teach philosophy at the college. he then proceeded to tell me how worthless his PhD in philosophy was. He could either write books, or teach. Being polite, and having to struggle to learn to edit what came out of my mouth, I nodded and looked concerned. But inside my head I'm shouting "YOU HAVE A DOCTORATE IN THINKING AND YOU DID NOT BOTHER TO THINK WHAT YOU WOULD DO WITH IT?" It's not like there are kings looking for court philosophers.